Entryway lighting is crucial for setting the atmosphere and show the way. You want to create a welcoming entrance to your home, and you also want to be able to walk safely up the steps. From the inside you want to be able to clearly identify who’s coming to visit. Your front door is usually what most guests approach (Or so they say. For some reason all our guests find the kitchen door first.) So, theoretically at least, the front entrance door is THE place to choose to make a statement! Lighting is one very important way to create a great first impression. A pair of wall sconces or lanterns on either side of the door can complete the look you want, whether it’s traditional, contemporary, rustic or artistic. Safety is of course also an issue and the right lighting is key to reducing trip hazards around your home. Wall lanterns are decorative and create a warm welcoming atmosphere. Combine them with landscape, step and path lights for a well-rounded illumination plan. A frequently overlooked benefit from outdoor lighting is the illumination it creates outside the windows. When you are in a room, without window coverings it keeps the windows from becoming “black holes” at night. Instead outdoor lighting visually extends the living areas to the outside. Lighting the secondary entrances to your home, like patio and kitchen doors, follow the same requirements as the front door, but the main focus might be on safety paired with a comfortable general light for outdoor entertaining. I’m not saying that you can ignore aesthetics and go ahead and install some of those glary security lights that will illuminate your neighbor’s back yard as well as yours. Choose lights that meet your needs for illumination as well as atmosphere and fit the style of your home. Light your back door for safety and comfortable yard illumination. Wall lights, lanterns, ceiling lights or pendants? Depending on the architecture of your home you can use wall sconces or lanterns flanking the doorway or lights mounted to or recessed into the ceiling – or a combination of both. With some minimal, clean, contemporary home designs it might be tempting to choose only recessed overhead lights. But keep the “flashlight-under-the-chin” effect in mind: Illumination directly from above is almost as ghastly as from below – and it can be almost impossible to see the facial features of a visitor with this choice of lighting. If this is still the lighting of choice, consider combining it with landscape lighting. Indirect illumination of landscape features or architectural details nearby is an elegant, unobtrusive way of adding light without the light fixtures taking center stage. The same principle goes for the must-have decorative fixture that looks wonderful at the front door, but does not shed sufficient light. It might just need a little help and could work well if you add other less visible light sources like a couple of recessed light. Recessed fixtures are a nice addition over garage doors or under eaves around the house, since they practically disappear, but provide the light that is needed. On porches it is a good idea to complement them with wall lights for added atmosphere. In my experience most homeowners tend to choose entry lights that are too small for the scale of the door and house front. With larger homes and taller ceilings, be bold! 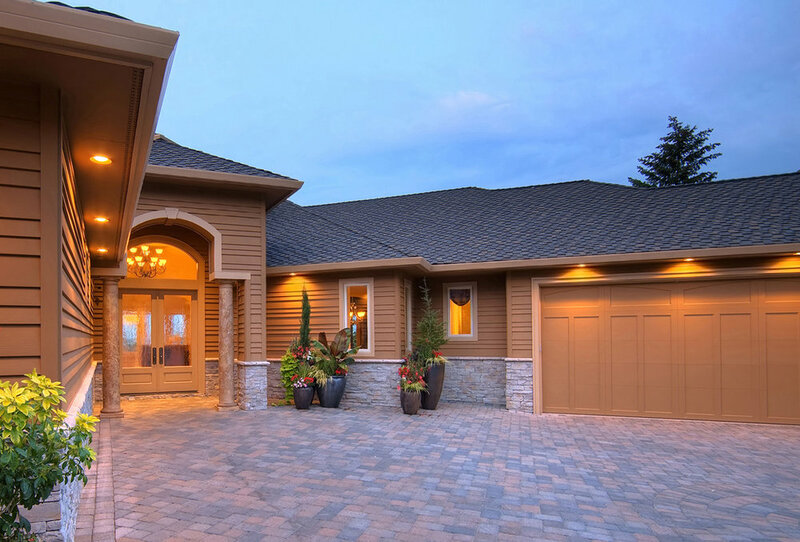 As for size: look at the proportions of your front entryway. Those small jelly-jar wall lights we all know will most likely look out of place next to the door in your new home, even if your parents also had them “and they worked just fine.” By the same token, no matter how much you admire those wrought iron lanterns that would be suited for a grand entrance they might very well seem overwhelming flanking your cottage door. The rule of thumb is that wall fixtures should be anywhere from 1/4 to 1/3 the height of the door. 1/4 of the height if you have a pair flanking the door and 1/3 if you are using a single lantern. If you are using two sizes of sconces on the front of your house, some for your front door as well as some for your garage, you’ll want to use the larger sconces at the front door where you want to create the focal point and the smaller ones in other areas around the house. As a rule of thumb, outdoor sconces or lanterns should be mounted with the center of the light source about 5’6” to 6’ from the ground and 8’ – 10’ apart. 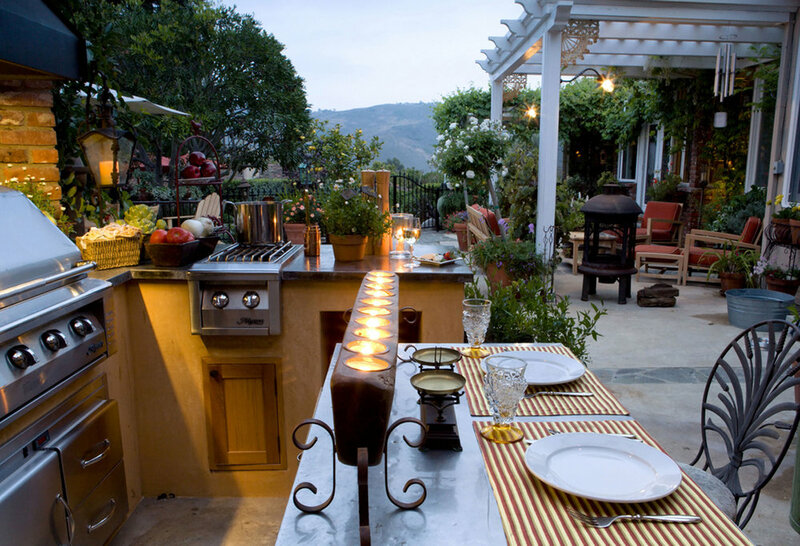 Patio Lighting creates a mood for relaxing and entertaining. Our decks and patios have become important extensions of our living rooms, kitchens and dining rooms. As we add state-of-the-art barbecues, outdoor kitchens, comfortable dining areas we want to add the comforts we experience indoors. Whether enjoying a romantic al fresco meal for two or entertaining a crowd, we want to see the food on our plate, look good, maybe feel romantic and also be able to move around without danger of tripping. Create a safe environment with atmosphere. One tip is to avoid glare and use as much indirect light as possible. Inconspicuous step lights and small light fixtures positioned under a railing or a banister can help you put the light exactly where it is needed to safely negotiate stairs and dark areas on the patio. Try to avoid the “runway-effect” of light sources lined up in a straight row unless. The trick is to illuminate an area without the light sources being the center of attention. Patio lights don’t have to be fancy or expensive to be effective. Try a combination of wall sconces next to the entryway, some lights for areas that need special attention like changes in terrain and compliment these with twinkling strands of lights in nearby trees or indirect light sources that add atmosphere by accenting architectural features or parts of the surrounding landscape. A little light goes a long way outdoors. In order to avoid glare and create atmosphere it is always preferable to use several light sources with a low wattage instead of a single one that will keep your neighbors awake. With LED bulbs, choose a color temperature of around 2700K for lights at the door, since they create a warmer inviting feel. For landscape lights a cooler color temperature works better. Plants look sickly under yellow light and fresh under cooler light, so look for lamps with a color temperature above 3000K. It might be practical for a variety of reasons to have the flexibility to choose the levels of light, so plan on installing dimmers to control the light levels of your outdoor lights, especially around your entertainment areas. This way you can go from security lights to mood lighting at the touch of a switch. Motion Sensors are wonderful,but needs to be positioned right, so you don't blind your guests with a bright, startling spotlight that suddenly turns on as they are approaching. It is the worst way to greet your friends. Landscape and path lighting looks the best if the light source is not glaring in your eyes, blinding you or arranged in an unnatural manner. That translates to: No runway lights flanking the driveway, but subtle illumination of rocks, bushes and other natural features along the way. Works just as well, but what a difference!